One of the quickest ways to get your publications list started is to import the references from another system. We support Bibtex, Reference Manager, Endnote, Procite (RIS), PubMed XML format, Endnote XML, MODS XML, Copac and Thomson ISI (Web of Science). 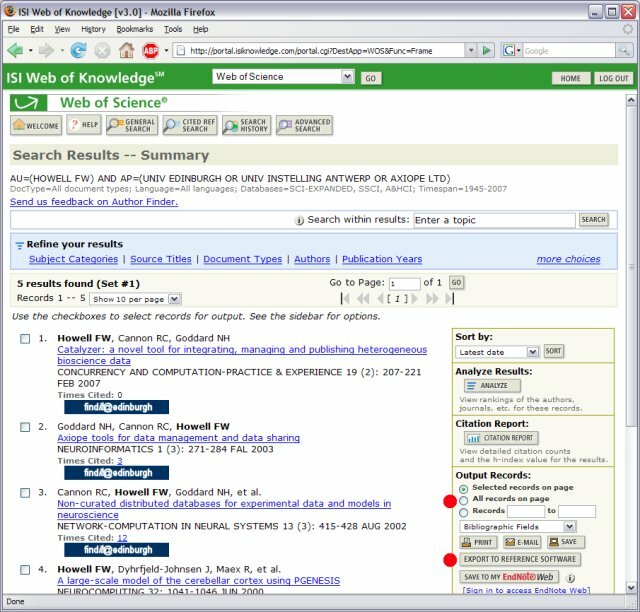 Most desktop reference management software will export references in one of these formats - we include screenshots from Web Of Science and EndNote below. Various public and commercial web based systems will also export lists of publications in a suitable format. If you have success with a service that is not listed here, please let us know so we can add it to the list. The Web of Science (Thomson Scientific) provides access to about 8,700 scientific journals. On the page for the main Web of Science database, there is an "Author Finder" link that lets you specify a particular author by name and institution(s). It then finds all papers by that author and provides an "Export To Reference Software" option. You can either save each page of results separately or specify a first and last reference number to download several pages in one file. The saved file can then be uploaded to PublicationsList.org on the "Add paper" page specifying the "ISI" format. Once the list is uploaded further notes and full text versions of the papers may be added at any time.